He might have been late to the game, so to speak, but P.K. Subban still managed to receive a standing ovation for his heartfelt and generous contribution of $10 million to the Montreal Children’s Hospital. Traffic delayed his arrival, but it mattered little to those who were on-hand Wednesday to welcome Subban as he announced this massive donation to a hospital that offers and provides so much to the children of Montreal who need it. Subban was joined by his parents and sisters, as well as Élise Béliveau, widow of Canadiens legend Jean Béliveau, at the press conference. The 26-year-old has earned rock star status during his time playing in Montreal since 2009-10, not only for his immense on-ice talents, but also for his close ties to the community. From hospital visits, often on his own time, to other charitable endeavors and fan-themed events, Subban is a beloved figure in the city. This June, he surprised a group of kids playing road hockey, grabbing a stick and joining in the game. While the dollar amount of his donation might be grabbing the headlines today, there’s much more to the story. 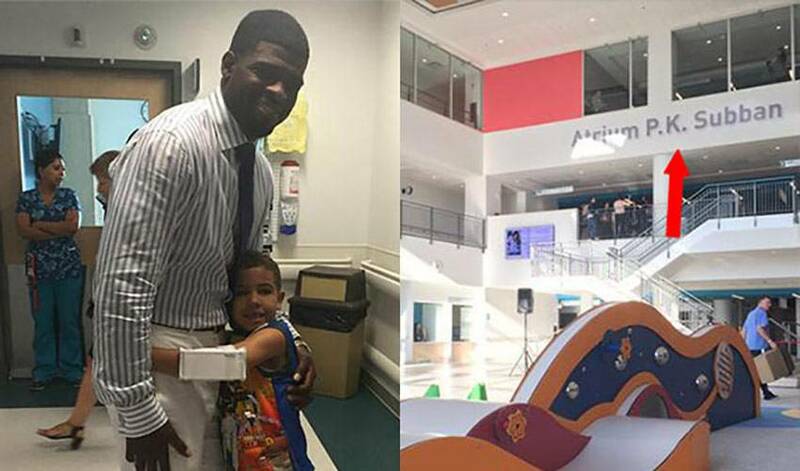 The relationship between Subban and the hospital extends beyond just a monetary commitment. It will also see the creation of P.K. 's Helping Hand, a fund that will aid families financially impacted by a child's illness. He will also join the Montreal Children’s Hospital Foundation (MCHF) Board of Directors. None of it will come as a surprise to Habs fans or those closest to Subban. Stepping up to help others, in the most thoughtful and meaningful way, just seems to come naturally to him.